Amsterdam Airport Schiphol, alternatively known as Amsterdam Airport or Schiphol Airport, is the hub international airport of the country of the Netherlands. Originally opened as a military base in 1916, Amsterdam Airport today serves as the gateway to the entire northern hemisphere and welcomes nearly 50 million passengers through its doors each year. Amsterdam Airport Schiphol (IATA code: AMS) is the busiest airport in the Netherlands and the hub of KLM. Flights to Amsterdam Airport Schiphol are provided by international airlines such as Emirates, British Airways and Qatar Airways. AMS is a 30-minute drive or a 7-minute train ride from the city centre of Amsterdam. 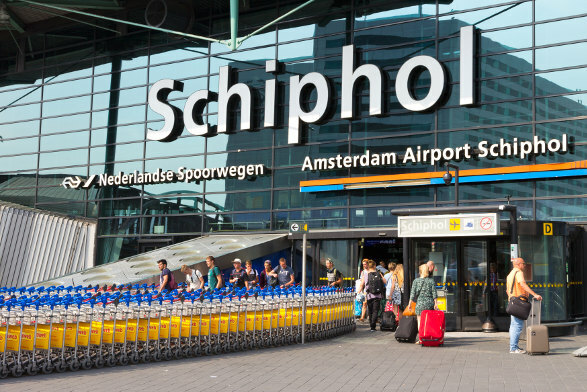 Book your cheap flights to and from Amsterdam Airport Schiphol online! Amsterdam Airport Schiphol is the third busiest airport in Europe, with a great number of intercontinental flights operating from its base. This airport is known for its exceptional design: one large terminal divided by three large departure halls, filled with everything you could need in an international airport. With nearly 100 airlines operating from Schiphol Airport, travellers have an easy and affordable travelling experience booking a last-minute flight to the famous city of Amsterdam. With plans to expand its six runways, Amsterdam Airport is getting ready to welcome even more travellers to the beautiful country of the Netherlands. Book a flight to Amsterdam Airport Schiphol with cheap flights from Lagos to Amsterdam. When you have some time to spare at Amsterdam Airport, explore its huge selection of stores, where you can indulge in some retail therapy or shop for all your essentials for your holiday in the Netherlands. The products that you can find at these outlets include fashion, jewellery, electronics, foods, desserts, alcohol, flowers, toys, cosmetics, books, sports gear and medication. Stay up to date on all the baggage restrictions you may need to observe at Amsterdam Airport Schiphol. When you’ve done all your shopping, sit back and treat yourself to a relaxing drink and a satisfying dish with the variety of meal options offered by a range of eateries, including bakeries, bars, fast food outlets, cafés, markets and restaurants. Several lounges are available at Schiphol Airport for you to rest at while waiting for a flight. These comfortable locations all include restaurants, bars and shops, with the exception of Lounges 2 and 3 (for long-haul flights), which also include a museum with science-based activities for children. Additional services and facilities for you at Amsterdam Airport Schiphol to make use of include an internet centre, a porter service, free Wi-Fi, a first-aid service, currency exchange, a lost and found area, a medical centre, meeting rooms, shower facilities, as well as workstations. Hotel ibis Schiphol Amsterdam Airport This beautiful 3-star hotel on a scenic setting is a brief 10-minute drive from Amsterdam Airport Schiphol. It includes several amenities, such as breakfast, a fitness centre, a terrace, a garden, a 24-hour business centre, a restaurant as well as a bar/lounge. A free airport shuttle and free Wi-Fi are additionally available. citizenM Hotel Amsterdam Airport This high-end 4-star hotel is a short 15-minute drive from Schiphol Airport. Its numerous amenities include a business centre, a 24-hour front desk, a library, a computer station, meeting rooms, gift shops, a restaurant and a bar/lounge. Free Wi-Fi is also available. Hilton Amsterdam This 5-star luxury hotel is a 15-minute drive from Amsterdam Airport. Amenities for you to enjoy at this establishment include a marina, a fitness centre, a conference centre, childcare facilities, air conditioning, a restaurant and a bar/lounge. In addition, there is free Wi-Fi. GWL Travelex, ABN Amro Bank and ATMs are available around Amsterdam Airport, giving you plenty of facilities to order foreign exchange. Several parking options are available for you at Amsterdam Airport Schiphol. These include open and shaded parking bays for short-term and long-term stays. Amsterdam Airport additionally gives you the convenience of reserving your parking online. Amsterdam Airport Schiphol is 22 km southwest of Amsterdam’s city centre. Trains, buses, taxis, Uber and car hire options are available to get you from the airport to your destination.